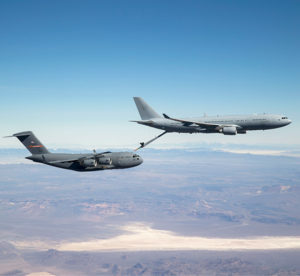 The first air-to-air refuelling from a Royal Australian Air Force KC-30A Multi Role Tanker Transport to a C-17 Globemaster III occurred Feb. 10, 2016, in restricted airspace near Edwards Air Force Base, Calif. The first air-to-air refueling from a Royal Australian Air Force KC-30A Multi Role Tanker Transport to a C-17A Globemaster III occurred Feb. 10. 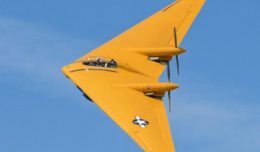 The five-hour sortie was conducted by members of the RAAF’s Air Warfare Centre Aircraft Research and Development Unit, 86 Wing and the 418th Flight Test Squadron. 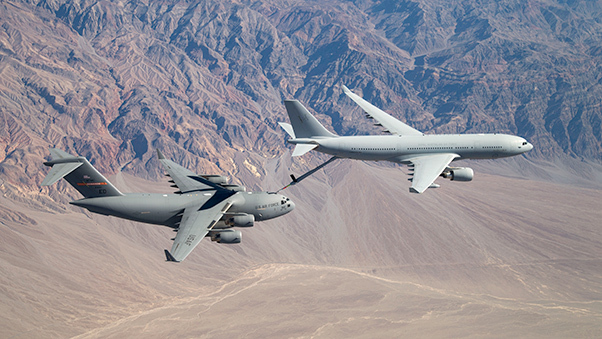 During the sortie approximately seven tons of fuel was successfully transferred from the KC-30A Advanced Refueling Boom System to the Edwards C-17. Air-to-air refueling of a C-17 significantly increases the aircraft’s range, making it capable of carrying heavy payloads further. The tests with the C-17A are one part of the RAAF’s Air Warfare Centre’s Flight Test Program. The next steps are air to air refuelling trials with the U.S. Air Force’s F-15 and F-16 fighters. 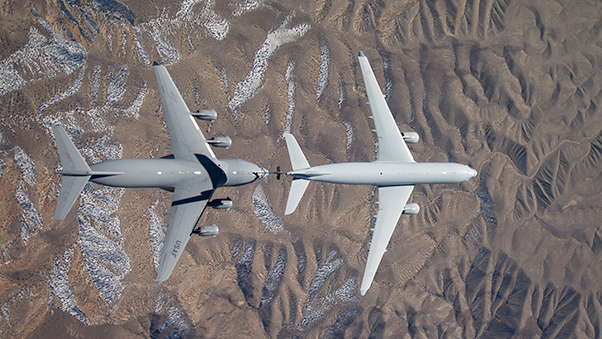 Overhead view of a Royal Australian Air Force KC-30A multi role tanker connecting with a U.S. Air Force C-17 Globemaster III from the 418th Flight Test Squadron at Edwards Air Force Base, Calif., Feb. 10, 2016. The ongoing testing with the KC-30A is part of a Coalition Tanker Aerial Refueling Certification effort. The first flight in the series of tests was Dec. 3 of last year when the KC-30 refueled an Edwards F-16. The successful refueling with a U.S. C-17 paves the way for trials with Australia’s own C-17s from the RAAF’s No 36 Squadron. One KC-30A from Number 33 Squadron, RAAF Base Amberley, is currently deployed to the United States to conduct these trials. More trials between a KC-30A and a U.S. C-17 cargo plane are scheduled to occur over the coming days, along with refueling trials with U.S. F-15 and F-16 fighters. A Royal Australian Air Force KC-30 tanker connects with a U.S. Air Force C-17 Feb. 10, 2016. As part of a Coalition Tanker Aerial Refueling Certification Effort, the RAAF KC-30A Multi Role Tanker Transport is conducting refueling trials with different U.S. Air Force aircraft. The effort began late last year and is scheduled to wrap up by the end of 2016. The Australian KC-30 is a Multi Role Tanker Transport based on the Airbus A330 commercial aircraft, which has been militarized, turned into a tanker, and has 270 passenger seats. The RAAF operates five KC-30A MRTTs, with two more joining the fleet from 2018. The KC-30A has a fuel capacity of more than 100 tons allowing it to fly up to 1800 kilometers from its home base and offload up to 50 tons of fuel for four hours.